LES SABLES D’OLONNE, France (AP) — French sailor Francois Gabart has won the Vendee Globe round-the-world race in record time, shaving six days off the previous record held by countryman Michel Desjoyeaux. The 29-year-old Gabart was the youngest skipper competing in the seventh edition of the sailing event. 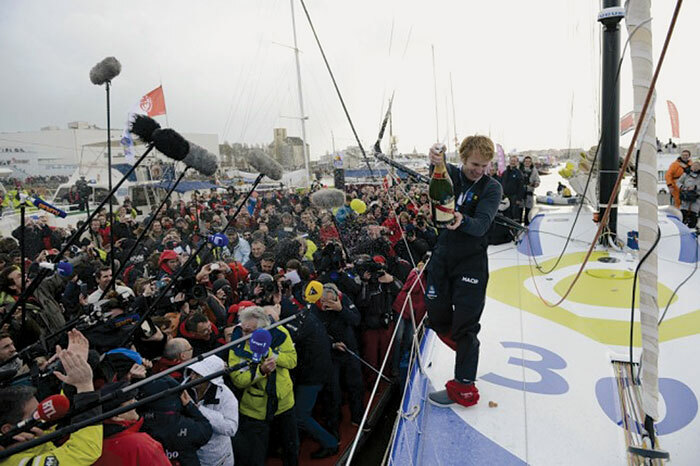 He crossed the finish line in Les Sables d’Olonne in western France at lunchtime Jan. 27, in his yacht MACIF. Gabart finished the race in 78 days, 2 hours, 16 minutes and 40 seconds — smashing two-time winner Desjoyeaux’s course record of 84 days, 3 hours, 9 minutes and eight seconds in 2009. Desjoyeaux did not compete this year. When Gabart crossed the equator on Jan. 15, he was already more than five days quicker than Desjoyeaux in 2009. Frenchman Armel Le Cleac’h and Briton Alex Thomson were in second and third positions, respectively, when Gabart crossed the line. Gabart’s average speed was 15.3 knots, and he covered a total of 28,646.55 miles, spending 44 days, 20 hours in the lead. Thousands of people packed the port in western France to give Gabart a hero’s welcome as he returned. He looked visibly moved and struggled to hold back tears as he stood at the bow of his yacht, waving back to the crowd. Twenty skippers started the race on Nov. 10.